Beyond promoting smoking initiation and preventing smokers from quitting, nicotine can reduce food intake and body weight and thus is seen as desirable by some smokers, perhaps especially women. During the last several decades, the molecular mechanisms underlying the inverse correlation between smoking and body weight have been investigated extensively. This appears to be especially true for the stimulation by nicotine of α3β4 nAChRs receptors, which are located on proopiomelanocortin (POMC) neurons in the arcuate nucleus (ARC), leading to the activation of the melanocortin (MC) brain circuit that is associated with food intake. Further, α7- and α4β2-containing nAChRs have been implicated in energy homeostasis, and the effects of peripheral hormones such as leptin, ghrelin, and peptide YY (PYY) are mediated by alterations in the MC circuit. 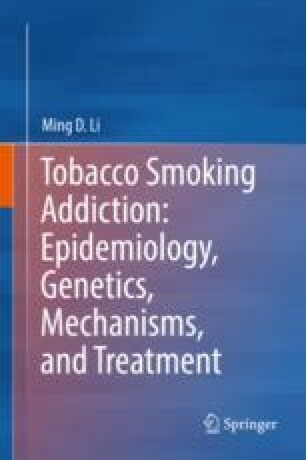 This chapter summarizes current understanding of the regulatory effects of nicotine on food intake and body weight according to the findings from the pharmacological, molecular genetics, electrophysiological, and feeding studies on these appetite-regulating molecules, such as α3β4, α7, α4β2 nAChRs, neuropeptide Y, POMC, melanocortin 4 receptor, agouti-related peptide (AgRP), leptin, ghrelin, and PYY.